In a true small house (400-1,000 sq. 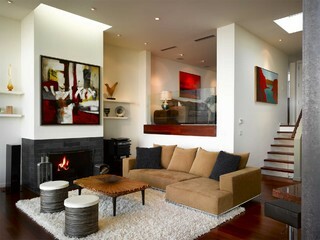 ft.), and especially a studio house, a split-level design offers a solution for three key issues. They are separation, storage, and elegance. The type of split-level that I am talking about is not to accommodate uneven terrain or lot size. It is a raised or lowered floor in a space that has a particular function like a living room, kitchen, office, or bed area. Let’s say you’re designing a small house with a great room and you want to have an office in this space but you want a sense of separation. A split-level design for the office space will accomplish this without adding walls that would reduce the feeling of spaciousness. Or maybe you’re considering a studio house but you want the area for the bed to be clearly delineated from the rest of the great room. A split-level design would do this nicely. Being clever about storage is a top priority when designing a small house. One of the ways to add storage space is by raising the floor in a particular area. In doing this you create a split-level design with storage below it. You can install drawers or simply add hinged or slider doors along the side for access. Those who are new to small house living may be concerned as to whether an elegance look can be achieved. Let me assure you that it can. Most the images we see of stylish homes are usually those of large houses and mansions. There is no reason that a small house can’t attain a similar look. 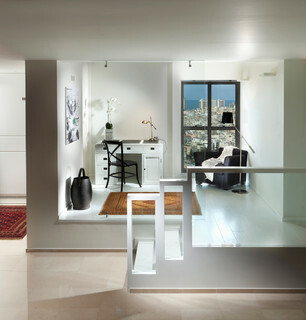 One of the ways elegance can be created is with a split-level design. 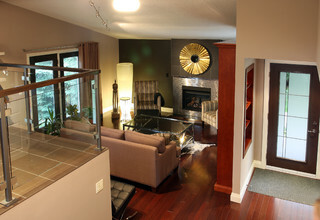 If done right, a split-level can add a look of sophistication to the interior of a small house. As with all products that have gotten smaller like motorhomes, cars, computers, and cell phones, innovation is required each time its size is reduced. The same goes for small houses.